Fine Tiffany Studios Lighting and Other Rarities Take Charge at James D. Julia’s 2017 Late Fall Rare Lamps, Glass & Fine Jewelry Auction. This phenomenal sale, featuring breathtaking examples from the world’s most desirable brands, lit the lamp with over $2.5 million in sales. 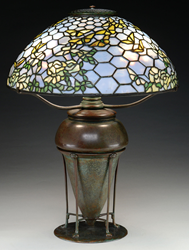 Tiffany Studios Rose and Butterfly Table Lamp, Realized $84,700. James D. Julia's December 1, 2017 sale proved once again why the company enjoys a well-deserved, global reputation for leadership in the fine antique glass, lamps, and lighting categories. The bidding was fast and furious throughout the auction, with bidders from all over the world competing over top-tier selections from Tiffany, Handel, Daum Nancy, and Galle, among others. After the hammer finally came to rest after a long and exciting day, 40 lots made $10,000-$25,000, 9 lots sold between $25,001 and $50,000, and a remarkable 8 lots realized over $50,000, pushing the total gross over $2.5 million. 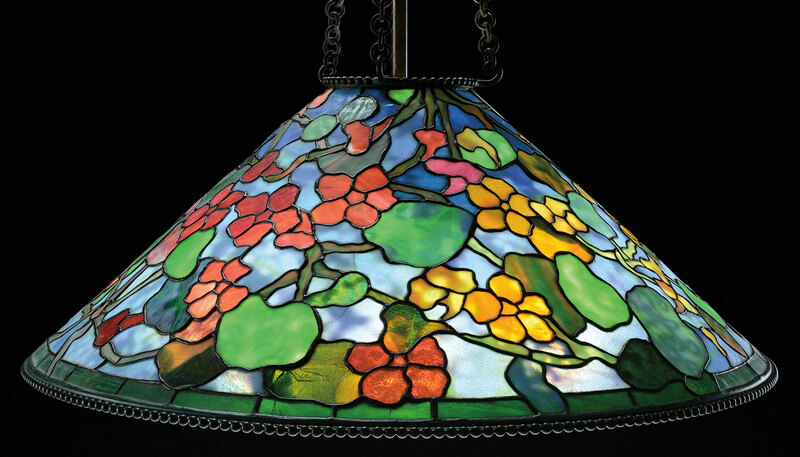 This auction’s colorful offering of Tiffany lighting truly caught the eyes - and interest - of collectors. Leaded examples continue to be favorites and included the day’s three top grossing sales. The first, lot 1473, was a highly desirable and petitely proportioned Rose and Butterfly table lamp decorated with yellow roses and striated yellow and red butterflies within a mottled blue and white opalescent honeycomb background. This absolute rarity, the first one ever handled by Julia’s experts, realized $84,700 on a $65,000-80,000 estimate. The second, lot 1516, was a Geranium table lamp blooming with red geranium flowers and large striated and mottled green leaves set against a striated blue and white background. This gorgeous example changed hands at $84,700. And the third, lot 1428, was a Nasturtium chandelier which sold for $84,700 on an $65,000-80,000 estimate. This big beauty simply glows with its mottled yellow and amber flowers and large mottled green leaves, set against a mottled blue background. Buyers were also clearly turned on with this auction’s offerings of other terrific Tiffany fixtures. Lot 1530, a pair of cast bronze Apple Blossom torchieres crowned with hexagonal shades decorated with pink and cream glass flowers was estimated at $30,000-40,000 and realized $45,375. And two chainmaille sconces detailed with iridescent glass panels and a Moorish design of tight swirls of bronze rope climbed to $22,990 - almost twice their high estimate! This sale’s selection of fine antique lighting from other top-tier brands was also electrifying. Excellent examples from Handel took the spotlight here. Perhaps the most outstanding was lot 1610, a reverse painted Aquarium lamp which made $60,500. This exquisite example is decorated with an underwater scene of fish swimming among aquatic plants, with each panel finished on the exterior with chipped ice. A similar example is pictured in the book Handel Lamps by Robert Falco, Carol Goldman Hibel, and John Hibel, page 119. 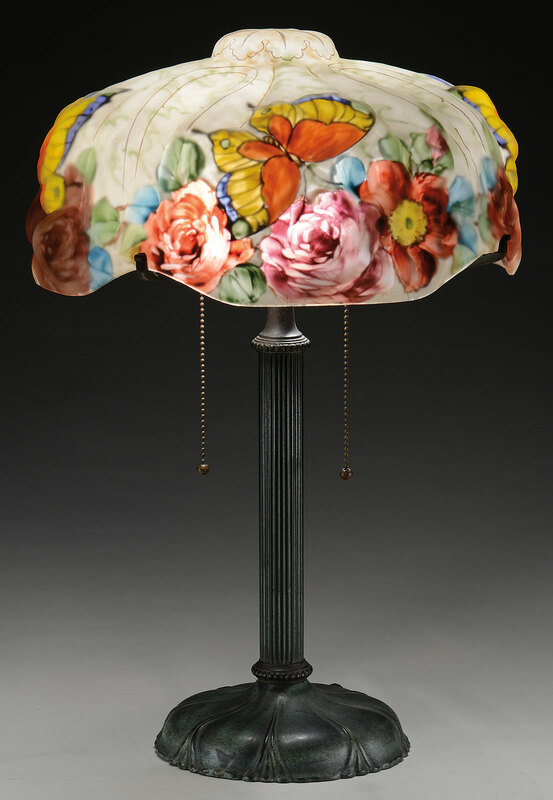 Other bright spots included lot 1638, a Pairpoint Puffy table lamp decorated with roses and butterflies that doubled its low estimate to realize $6,050, and lot 1653, a Morgan Pansy table lamp that sold for $22,990. 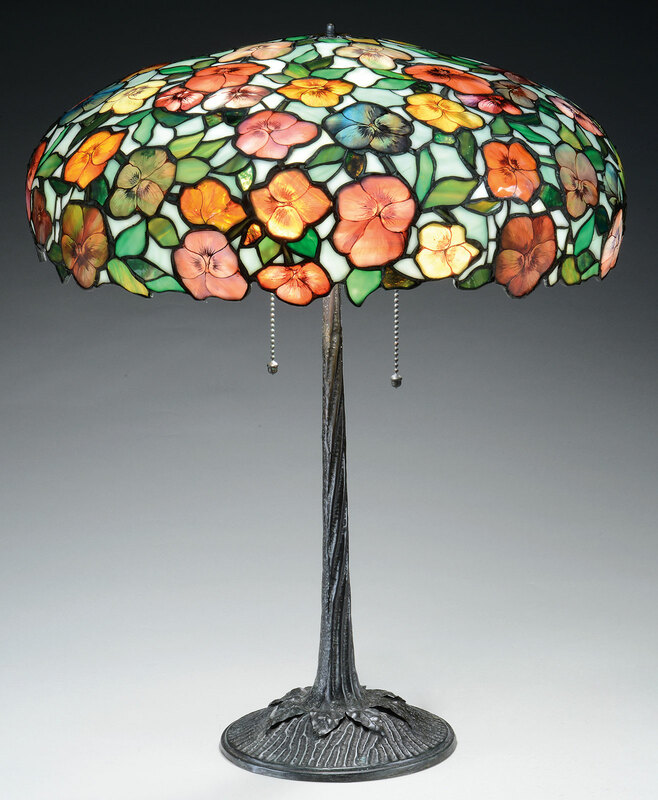 This particularly attractive and well-made example blossoms with its leaded glass shade covered with colorful, hand enameled flowers. Galle art glass continues to captivate collectors with its timeless quality, craftsmanship, and outstanding designs. Lot 1115, a unique Butterflies in Flight cameo vase with an opaque powder blue glass outer layer on top of a yellow glass core, took flight at $19,360. And lot 1111, a mold blown Rhododendron vase featuring unique, somewhat dichroic glass (rich green and bright red when unlit and red/amber when lit) made $18,150 - more than 2.5 times its low estimate! Fine art glass from other French and English manufacturers also made headlines in this auction. Lot 1005, a Daum Nancy vase with a quatrefoil base leading to a free-form organic mouth and decorated with leaves, stems, and flowers, was a natural favorite with collectors. It sold for $13,310. Lot 1010, a Daum Nancy Corbeau et Grenouille cameo vase featuring a raven resting on a tree branch, cameo flowers, and a frog all set against an amber to red mottled background, climbed to $15,125. Lot 1155, a Le Verre Francais Poissons vase detailed with orange fish, green aquatic vegetation, a purple foot, and internal bubbles realized $13,310. An example of similar pattern is illustrated in the book Charles Schneider by Joulin/Maier, page 175. 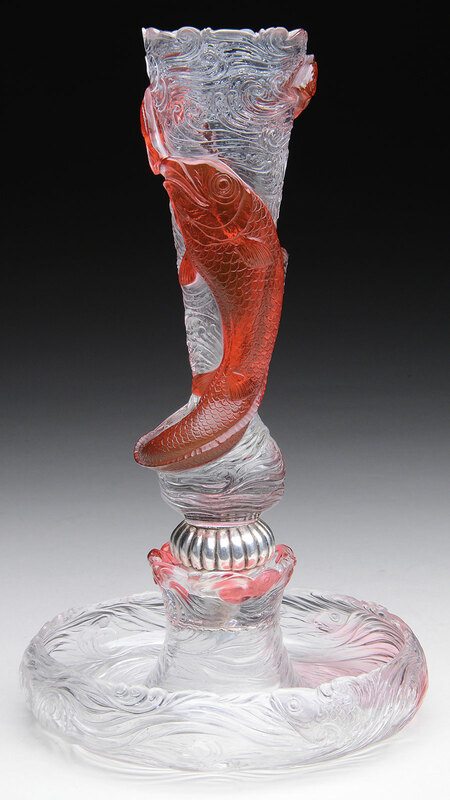 Lot 1259, a Webb epergne decorated with padded red fish and a carved center bud vase, netted $13,310. And lot 1220, a heavily enameled Camille Faure vase in blue, white, black, purple, and mauve made $6,655. Lovely examples of decorative and functional art from United States manufacturers struck a patriotic chord with buyers. Lot 1453, a Tiffany Studios bronze Treasure Chest inkwell hit the jackpot, more than tripling its low estimate and realizing $17,545. Lot 1588, a set of four Tiffany Studios polychromed Zodiac blotter corners did astronomically well, making $9,075 on its $500-800 estimate. 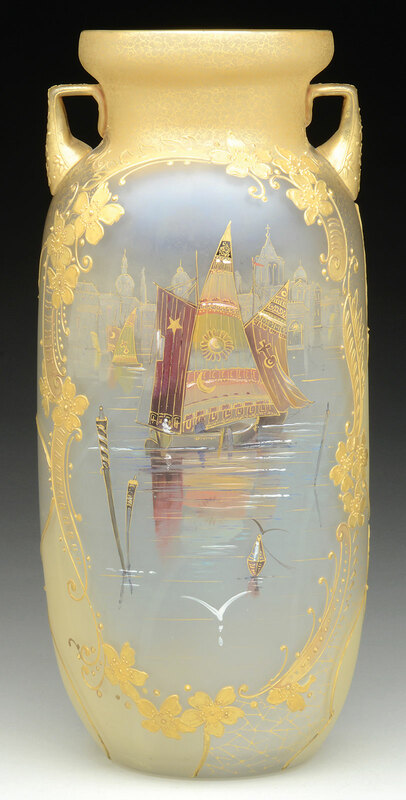 Lot 1706, a Royal Flemish vase decorated with a Venetian harbor scene rose to $14,520 on its $3,500-4,500 estimate. Lot 1281, three William De Morgan pottery chargers featuring birds and wildlife in shades of tan, red, and orange, served up $21,780, more than seven times its high estimate. And lot 1724, a 7” tall plated amberina pitcher - one of a number of fine examples from an unreserved collection from Ontario, Canada - sold for $7,260, more than twice its low estimate. This sale tempted customers with nearly 100 completely unreserved lots of fine jewelry from private estates. Lot 1358, an 18kt yellow gold, carved coral, and diamond suite consisting of a ring, pendant and earclips with rope-twist surround and pave highlights - originally estimated at $400-600 - sold for a whopping $3,025. And lot 1340, a platinum and diamond ring centered by a 3.76ct cut-cornered rectangular modified brilliant cut yellow diamond sparkled its way to $20,570. This comprehensive sale rounded out with a great variety of pottery, bronzes, paperweights, and other decorative art selections. Lot 1283, a very appealing 7” tall Wedgwood Fairyland Lustre Goblin vase, decorated with brown goblins sporting blue wings, realized $10,890. James D. Julia’s next auction will be the company’s Fine Art, Asian & Antiques sale on February 7th-9th, 2018. The next Rare Lamps, Glass & Fine Jewelry auction will be in June 2018. James D. Julia, Inc., one of the top ten antique auction houses in North America, is headquartered in Fairfield, Maine. The company also has an office in Boston, Massachusetts. In business for over 40 years, the company conducts high-end antique, collectible, and decorative arts auctions throughout the year. Julia’s routinely establishes new world records through its auctions. Julia’s has three divisions, including Rare Firearms and Militaria; Fine Art, Asian & Antiques; and Rare Lamps, Glass & Fine Jewelry. Each division is staffed by knowledgeable professionals and is internationally recognized and respected. For more information on James D. Julia, Inc. and the company’s June 2017 Rare Lamps, Glass, and Fine Jewelry sale, please visit http://www.jamesdjulia.com. James D. Julia, located in Fairfield, ME and Woburn, MA. Daum Cameo and Enameled Organic Form Vase, Realized $13,310. Daum Nancy Corbeau at Grenouille Cameo Vase, Realized $15,125. 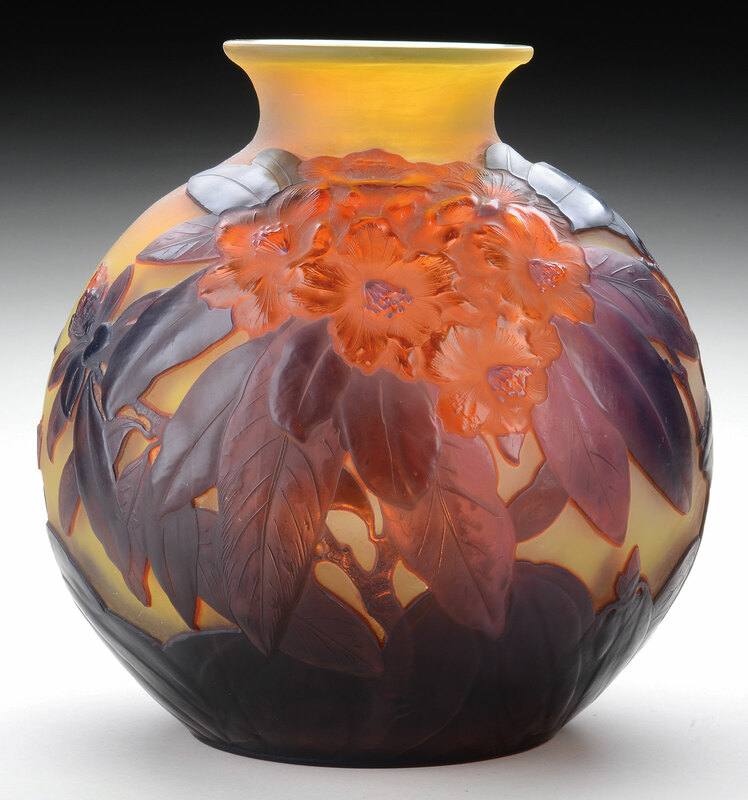 Galle Mold Blown Rhododendron Vase, Realized $18,150. Galle Butterflies in Flight Cameo Vase, Realized $19,360. Le Verre Francais Poissons Vase, Realized $13,310. 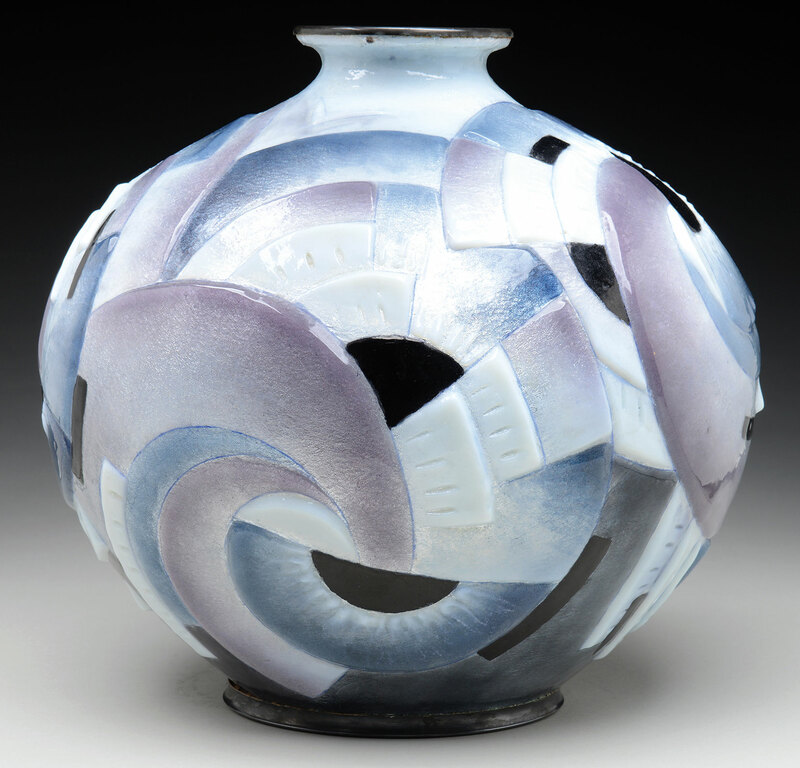 Camille Faure Art Deco Vase, Realized $6,655. Webb Rock Crystal Curio Cabinet Epergne, Realized $13,310. Three William de Morgan Pottery Chargers, Realized $21,780. 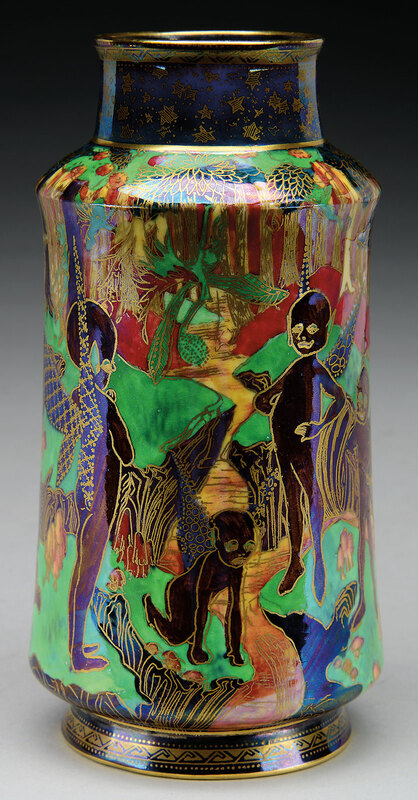 Wedgwood Fairyland Lustre Goblin Vase, Realized $10,890. 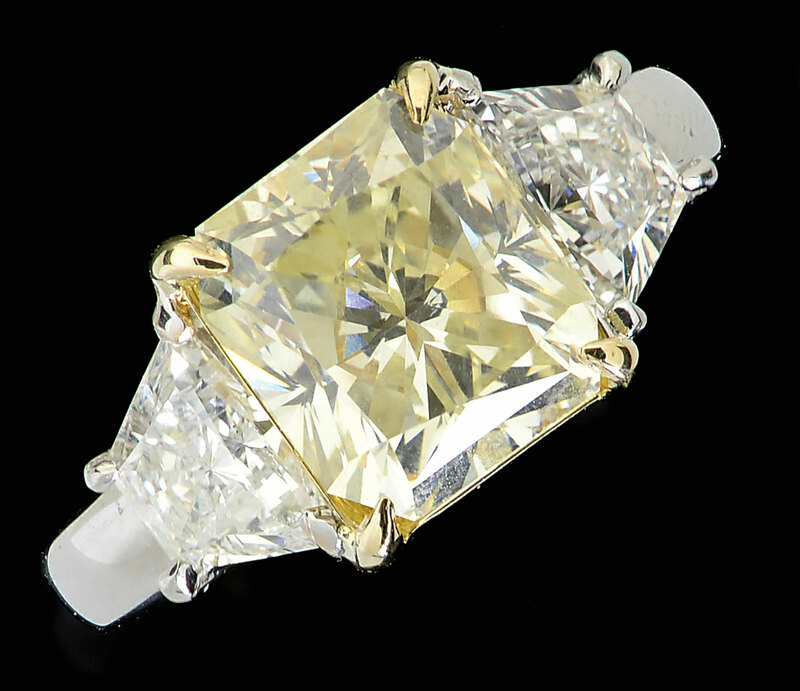 Platinum, Yellow Diamond & Diamond Ring, Realized $20,570. 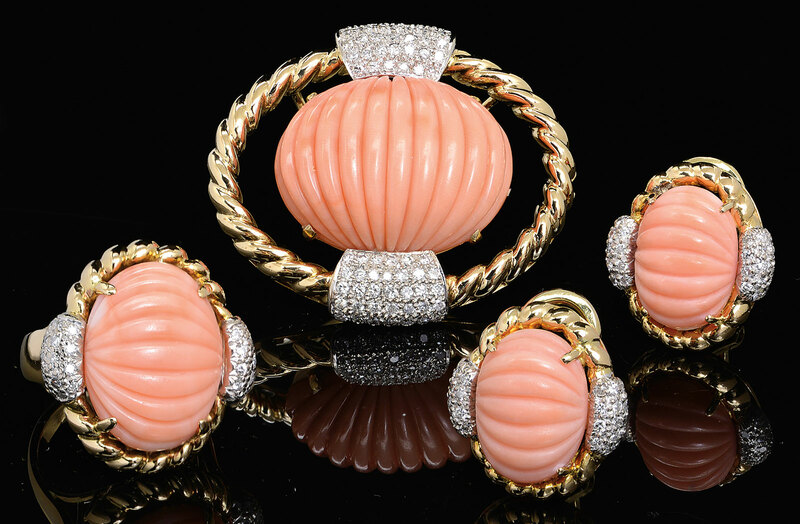 18kt Yellow Gold, Carved Coral and Diamond Suite, Realized $3,025. Tiffany Studios Nasturtium Chandelier, Realized $84,700. Tiffany Studios Bronze Treasure Chest Inkwell, Realized $17,545. Tiffany Studios Chainmaille Sconces, Realized $22,990. 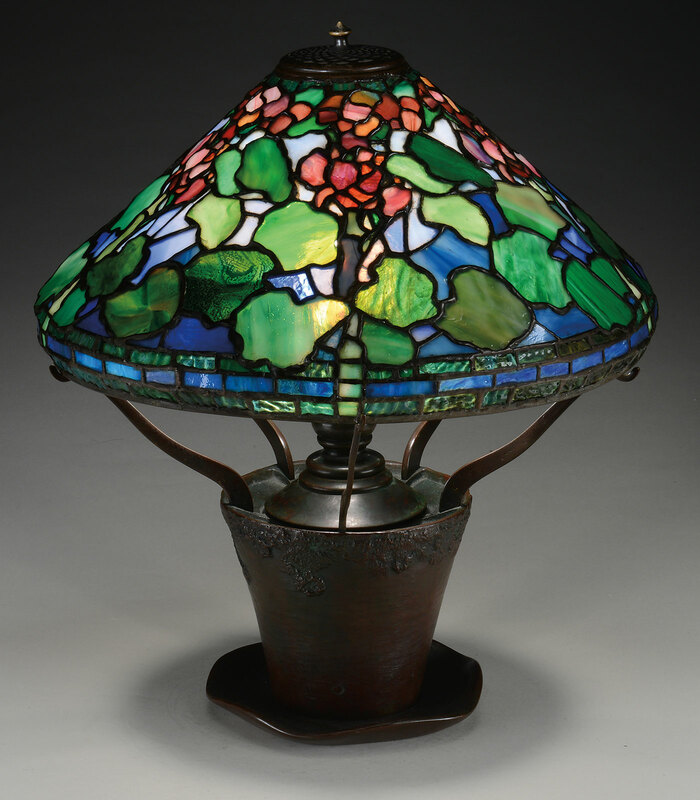 Tiffany Studios Geranium Table Lamp, Realized $84,700. Tiffany Studios Apple Blossom Torchieres, Realized $45,375. 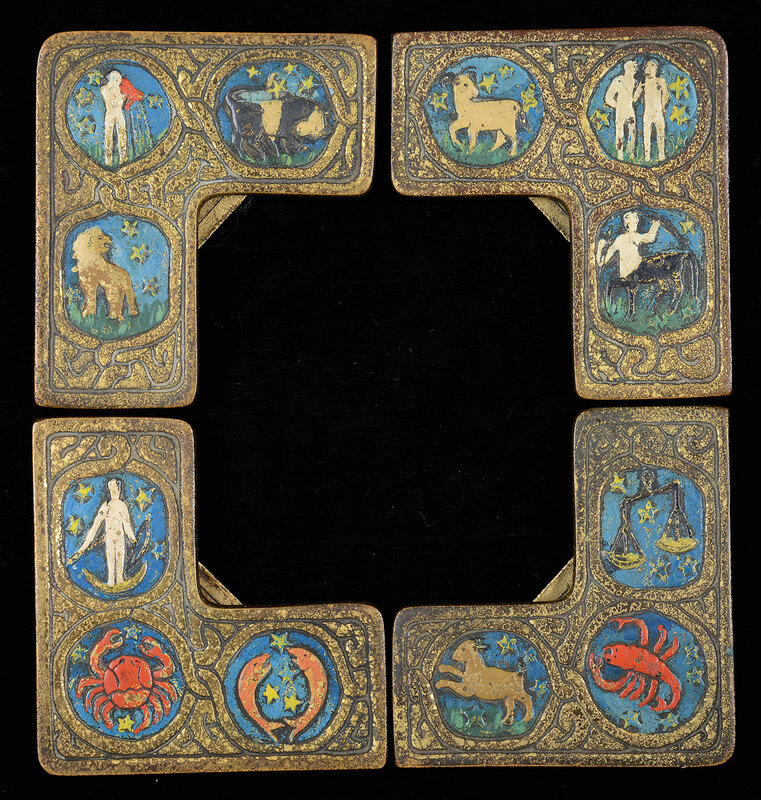 Tiffany Studios Polychromed Zodiac Blotter Corners, Realized $9,075. 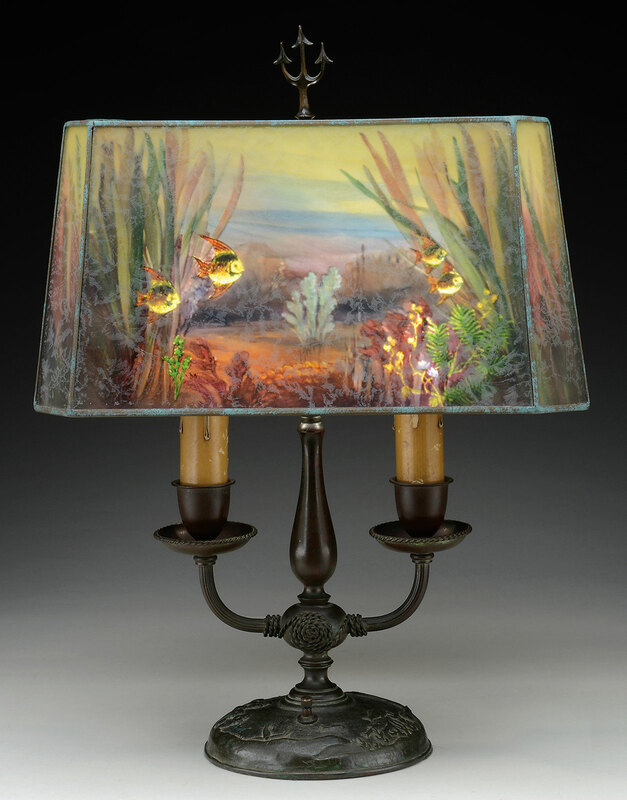 Handel Reverse Painted Aquarium Lamp, Realized $60,500. Pairpoint Puffy Table Lamp, Realized $6,050. Morgan Pansy Table Lamp, Realized $22,990. Royal Flemish Venetian Vase, Realized $14,520. 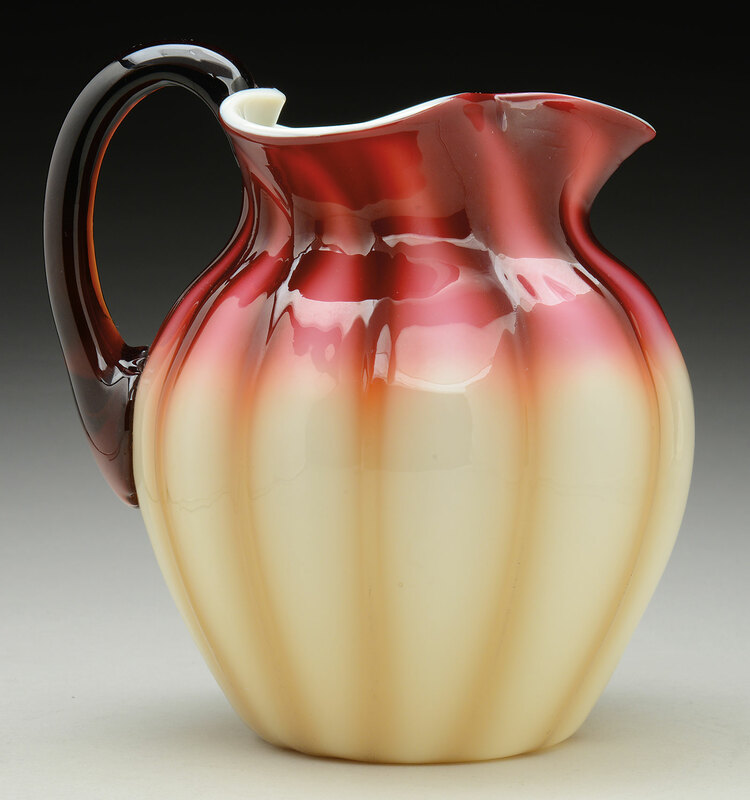 Plated Amberina Pitcher, Realized $7,260.